Gregorio Allegri’s ‘Miserere mei, Deus’ is one of the most devastatingly beautiful pieces of choral works ever composed. It is perhaps the best known example of late-Renaissance music, but, if the strictures of the Papacy had been followed, it would have been unknown outside of the confines of the Sistine Chapel. The piece was written sometime before 1638 and hadbecome so famous in the next century that the Papacy banned, on thepain of excommunication, its performance outside of the Sistine Chapel. Formany years, the only way of hearing the music would be to attend one of the twoHoly Week matins services in which it was performed. 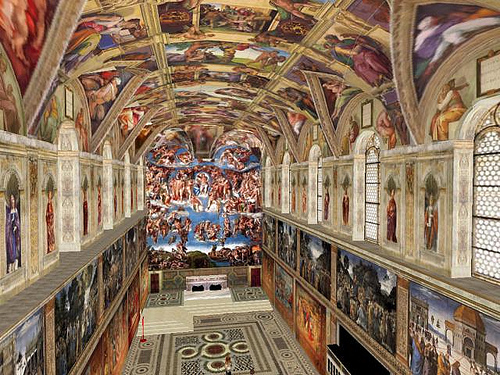 Rarely can the senses have been so ravished – the Baroquesplendour of Michelangelo’s Sistine Chapel, the soaring voices of the Papal Choirand the otherworldly genius of Allegri’s composition provide the evocative setting.At 3 am, theservice would begin, with the light of 27 candles burning brightly, dancingsacred light off the newly painted frescoes. They were extinguished one by oneuntil only a single flame was left. The service was often led by the Pope, andmust have been an experience of religious ecstasy for the Holy Week pilgrims.Rarely can the divine have been so sumptuously invoked. It was this expression of devotion that was sojealously guarded by the Supreme Pontiff. Whether out of fear of the music’simpact being diluted or a simple desire to retain the celebrated work withinthe confines of Rome and thereby ensure the attendance of devotees, the Papacyforbade the work to be written down or sung outside of the Sistine Chapel. The music remained largely confined to Rome untilits next brush with genius. On 11 April 1770 Leopold Mozart and his sonWolfgang arrivedin Rome as part of their grand tour of Italy. They had arrived in HolyWeek, in time for Easter and in time to attend the Wednesday Tenebrae in theSistine Chapel and hear the famous Miserere. Mozart may not have let loose the secrets of Rome,but the composition did soon after find its way to London via Dr Charles Burney. And, oncerevealed, the music became widely available. It is unlikely that Mozart was the sole conduit for its circulation – written copies had been made available to the Holy Roman Emperor, for example – but Mozart was the composer best able to do justice to Allegri’s composition.